Kundalini Yoga was introduced by Yogi Bhajan to the West in 1969. This includes Yoga poses or deep meditation which are spiritual practices that can awaken the Kundalini. To understand the movement of Kundalini better, you must familiarize yourself and have adequate knowledge of the nervous system, the spinal cord in particular because the Seven Chakras are believed to be found here. The Seven Chakras are comprised of the heart, throat, pineal gland, pituitary gland, basic survival instincts, ego, and sexuality. Kundalini – Awakening the Snake has seven layers, with each layer having seven more sub-layers an therefore makes that a total of 49 degrees awakening. It is said that every person has their Kundalini awakened but could be at a very small degree. This makes it a matter of how awakened the Kundalini is and not whether it is awakened or not. In India, the degree of the Kundalini energy’s awakening is symbolized by the number of cobras that hover over a yogi’s head. Usually, around 1 to 5 cobras are seen, and it would be seldom that 5 cobras can be depicted. This symbolizes a spiritual teacher or ascended master of Kundalini. In China, it is symbolized by a sage riding or standing on a dragon, similar to the Bodhisattva Kuan Yin. In Egypt, the degree of awakening is symbolized by a snake on a pharaoh’s headgear. The snake is viewed throughout history as a symbol of earthly desires and temptation as in the Garden of Eden. It is only by controlling this serpent or snake that one is able to conquer these earthly desires and awaken their Kundalini. The Kundalini in your body can be awakened through various ways. It can be done through the practice of Asanas, Mantras and Pranayama. It can be achieved through training and concentration of the mind, the practice of Hatha Yoga, Bhakta Yoga or Jnana Yoga, selflessness and intellectual inquiry. Trying to awaken the Kundalini by force can be dangerous and it is important to seek the help of a guru. Pursuing it on your own risk can result to symptoms such as mental confusion, headache or a heavy feeling in your head, psychosis, stress, intense mood swings, depression, irregular breathing, epilepsy or other forms of involuntary body movements, and could even lead to immoral behavior. The Kundalini must never be awakened by force because just like a real snake, it can strike you if provoked. A guru can be compared to a professional snake handler and will be able to guide you. He will teach you how to tame and properly deal with this snake and handle your Yoga practice correctly. The Kundalini – Awakening the Snake enables the brain cells to experience higher levels of consciousness. The overall quality of the human body dramatically improves. It becomes less prone to illness and diseases. It allows some people to become charismatic leaders, geniuses and great spiritual masters. As this energy is awakened more, both positive and negative qualities of a person are magnified to a very high degree. Awakening your Kundalini does not require too much effort. What you would need basically are patience, dedication and perseverance. However, before attempting anything, you must be prepared. Your physical body must be cleansed and strive to purify your inner self, so that the Kundalini energy can flow smoothly. This would mean purity of mind and body, eating nutritious food, drinking lots of clean water, and having regular exercise. You must develop strong virtues and remove any insecurities or vices and fight other weaknesses. The heart and crown Chakra would be your key to awakening the Kundalini energy to a higher degree. They must be activated and awakened first. The heart Chakra requirement is met when you can truly love everyone and you can see the beauty in everything. This way, you will always see the bright and pleasurable side of all things. The crown Chakra is your pineal gland, which will open once you have been able to have an out-of-body experience and see into other dimensions. You will truly know who you are and clearly perceive reality. With all these met, you will allow the Kundalini – Awakening the Snake safely and to a higher degree and will be able to regulate the energy coming in. 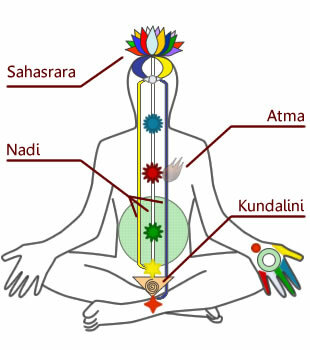 Once the Kundalini is awakened, it passes through the centers of consciousness or Chakras that reside in the human body. It is thought that the body has Seven Chakras, and each one provides a certain power when stimulated. The Kundalini movement is felt by the presence of either a cool or warm breeze on the palms of the hands or on the soles of the feet. Some can feel nervousness, trembling and some pain in different Chakra areas but these are much less and insignificant compared to the favorable ones. The pleasurable outcome would be bursts of joy, tingling sensations and even transcendental visions. The Kundalini – Awakening the Snake experience is reported to be a feeling like an electric current running along the spine. An awakened Kundalini gives you ultimate happiness and according to some yogis, is the beginning of the path towards enlightenment. Due to its powerful and highly beneficial effects, Kundalini Yoga is regarded as the most powerful form of Yoga today, and is even called the mother of all Styles of Yoga. This entry was posted in Magic, Meditation, Spirituality, Yoga and tagged health and wellbeing, Kundalini, Magic, Mantrik, meditation, Witchcraft, Yoga by Guest Author. Bookmark the permalink.